Absolutely one of the best jazz festival trips is to South Africa for the annual Cape Town Jazz Festival (“Africa’s grandest gathering”), which remains the signature such event on the continent. Although the actual Cape Town Jazz Festival, which is held in late March at the beginning of what for the Southern Hemisphere is the equivalent of their Fall season, is a long-weekend event, prospective CTJF festival goers are urged to extend their stay in-country to sample one of the most beautiful countries on the planet. After all, from the U.S. northeast its a 17-hour flight on average – and that’s just to Johannesburg, Cape Town is another couple of air hours south – and who wants to travel that far for just a weekend! Occasional Independent Ear contributor Ron Scott, jazz correspondent for the historic Amsterdam News, traveled to the CTJF for this year’s event, his first trip to South Africa, and here’s his report. Covering the 2016 Cape Town International Jazz Festival was an emotional experience that broadened my concept of South Africa during this maiden voyage visit. It was more than musical I was in South Africa, the country that enacted apartheid with the same shameless hatred as America enforced racism, segregation and lynchings. South Africa the home of the ANC. The home of Nelson Mandela, Ahmed Kathrada, and Stephen Biko (died in police custody 1977) like their U.S. black brothers (Malcolm X, Dr. Martin Luther King, Jr.) they were committed to freedom and willing to die. Being home in the motherland was an opportunity to witness through my lens and examine the myths and truths of South Africa. To dispel American propaganda and that dastardly slight of hand routine that always tries to stir one from the truth. On arrival at the festival site, proceeding into the huge state-of-the art Cape Town Convention Center amongst the bustling music fans it was clear to comprehend the black emancipation but through the look in their eyes and conversation it was clearly understood the struggle continues in full force on both continents. This on-going struggle is held together by a music connection; the excitement of improvisational movements, a rhythmic flow that draws all of us together to dance in its most spirited moments taking relief from the noisy sounds of life’s struggles. Nomsa Mdhluli, a festival publicist stated there were over 35,00 people on hand for the two-day festival (April 1-2). Like all jazz festivals it was a matter of so much music, so little time. Over 100 artists performed in the Convention Center’s five venues. 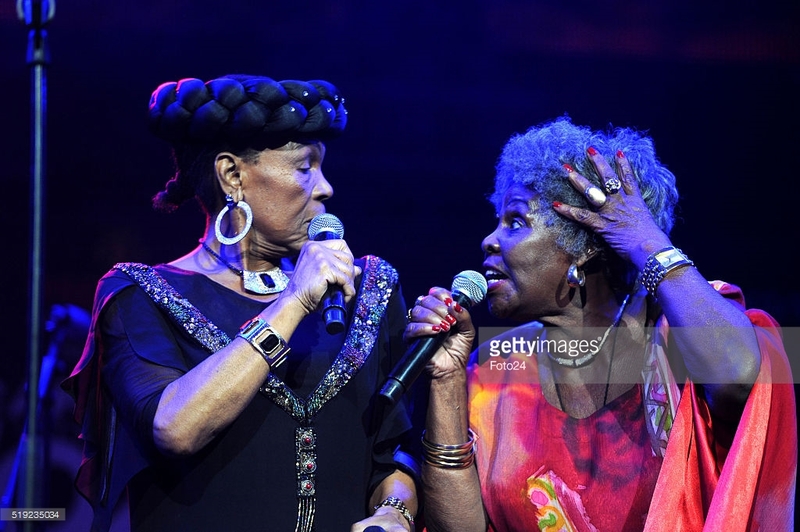 One of the weekend’s most lauded performances was South Africa’s own Legendary Ladies in Song: Dorothy Masuka & Abigail Kubeka featuring Lemmy “Special” Mabaso. They performed in the Kippies venue, which seemed to be the size of a football field (with three large video screens) holding at least 2,000 people mostly standing and dancing to every groove. The actor Idris Elba made a stage cameo for the introduction. Masuka is known as a jazz singer but her fusion of swing and Zulu melodies gave another perspective to the sound of jazz. Early on her political commentaries, primarily through her song “Dr. Malan” got her exiled by the apartheid government for over 31 years, and every copy of the song was destroyed. Kubeka is more of a cabaret singer but just as swinging. She was discovered by Miriam Makeba and has performed alongside Eartha Kitt and Sarah Vaughan. “Special” played a mean saxophone and broke out his penny whistle. One of the most rousting performances of the festival with a band kicking feverishly throughout. For straight ahead jazz with skating African rhythms Benjamin Jephta Quintet followed the tradition of jazz with their South African roots. Jephta is one of South Africa’s young guns, an electric bass and acoustic bass player. The composer grooved with his able comrades; pianist Kyle Shepherd, trumpeter/flugelhorn, saxophonist Sisonke Xonti and drummer Sphelelo Mazibuko. Their repertoire includes songs like Homecoming (Jephta), the name of their current CD. It’s a mid-tempo blend somewhat blues oriented that allowed the band to branch out on a mellow track with a haunting saxophone solo along the lines of a stimulated Coltrane prayer, rousing drums on the back drop, piano riffs. These musicians were in an intuitive mode never playing too many notes but allowing the audience to bask in the groove. They proved to be no strangers to the hard bop context with drummer Mazibuko wailing from the Elvin Jones school of drumming. “I want to give the listener a musical biography of my life by using the harmonies and melodies associated with my upbringing,” said Jephta. Don’t be surprised if these talented jazz cats show up playing gigs in New York. 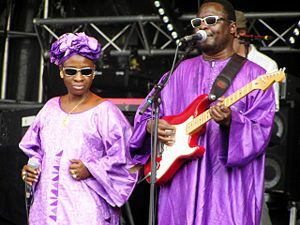 Amadou Bagayoko and Mariam Doumbia known as (Amadou & Mariam) are known internationally as traveling exponents of the blues, their combined voices along with Amadou’s blues guitar are a force in Africa and worldwide. They had a hypnotic magic that captured the audience from the first song to their encore. The eclectic composer, singer, bassist and keyboardist Meshell Ndegeocello performed on the large outdoor stage Manneberg before over 1,000 dancing and singing fans. She noted, “I try to create a set that flows well and feels well.” Her latest CD is a tribute to Nina Simone: Come To Me. The surprise of the festival came on the final evening during the performance of BADBADNOTGOOD (BBNG), a young quartet (keyboardist Matthew Tavares, drummer Alexander Sowinski, bassist Chester Hansen, and saxophonist Leland Whitty), who mixed jazz, hip hop, rock and off-the cuff improvisation into their own brand of swing which was heavy on jazz improvisation. As they were finishing up their set the poet, actor, and hip hop icon Yasiin Bey (Mos Def) stepped on stage and intoxicated the surprised audience for 45 minutes. Roberto Fonseca the Cuban pianist who combines classical, jazz and his Afro-Cuban roots never disappoints. His classical improvisational riffs, hard-hitting jazz crescendos and ever-winding rhythms were seamless. “I will try to play my two-hour concert in one hour, said Foneseca.” Of course he didn’t but it was a pleasure watching him make such an enjoyable effort. Shiela E, a protege of Prince performed with a large ensemble with her father Peter Escovedo on a few tunes. She was a ball of high energy performing “Baby Take Some Time” among other tunes. Mark Turner one of my favorite tenor saxophone players held court with his group consisting of trumpeter Jason Palmer, bassist Joe Martin and drummer Marcus Gilmore. 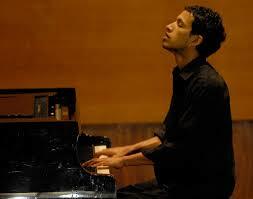 TopDog an Afro jazz band focusing on the Cape Town sound featured the leader pianist Camillo Lombard along with musicians offering another perspective on the sound of jazz. Victor Wooten known for his creativity on the electric bass kept the audience on the edge with guitarist Regi Wooten and drummer Derico Watson. The press conferences I attended included young journalists who participated in the 17th CTIJF Arts Journalism course. Seeing them involved asking pertinent questions of the artists was very inspiring. Yes, music is a link that brings us together.